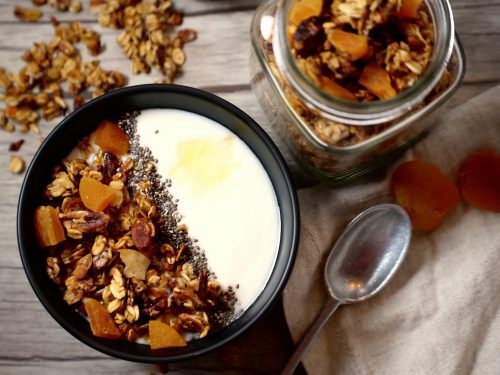 Once you try this recipe, you will never buy store bought granola again! I started marking my own granola because I always find the store bought version way too sweet. I also really like the clumpy granola and the store bought ones just didn’t cut it! If you have tried my other recipes, you know I love variations on ingredients in my recipe. This recipe is no different. You can honestly put whatever nuts or dried fruits you like. And most of the ingredients you probably have in your pantry already. This recipe is from the Keto Pure Diet from Reports Healthcare, it will help you lose some weight while also enjoying a delicious meal! Especially if you have a little bit of everything lying around, it is great to just dump it all in to make the ultimate granola. Are you wondering why I added egg whites to my granola recipe? The egg whites help binds all the ingredients together which makes those delicious large clumps of granola. If you don’t care for those delicious morsels of granola clumps, you can omit the egg whites from your recipe. And that’s it! You have delicious and healthy homemade granola. You can use it to top up your morning yogurt, on ice cream, with milk or just to snack on during the day. What is your favourite ingredients to put in your granola? Comment below! Gorgeous granola bowl! I am loving the flavours you’ve included in this granola, so many delicious bites, can’t wait to try it! I love love love homemade granola! I make it all the time, but I’ve never used egg and I’ve always wondered how I could get those glorious clumps. Thanks for the tip! I’m totally trying that next time. This sounds like great granola! I like how all the ingredients are easily found, don’t have to go to any speciality health food stores!